Clackamas County Sheriff's Office Deputy Jonah Russell is eager to build connections with local youth. Russell, who worked for the Sheriff's Office for several years, started as the Estacada School District's resource officer on Tuesday, April 2. He is also a member of the Sheriff's Office's SWAT Team, a certified foster parent and youth football coach. Russell will spend 40 hours each week as Estacada's school resource officer. 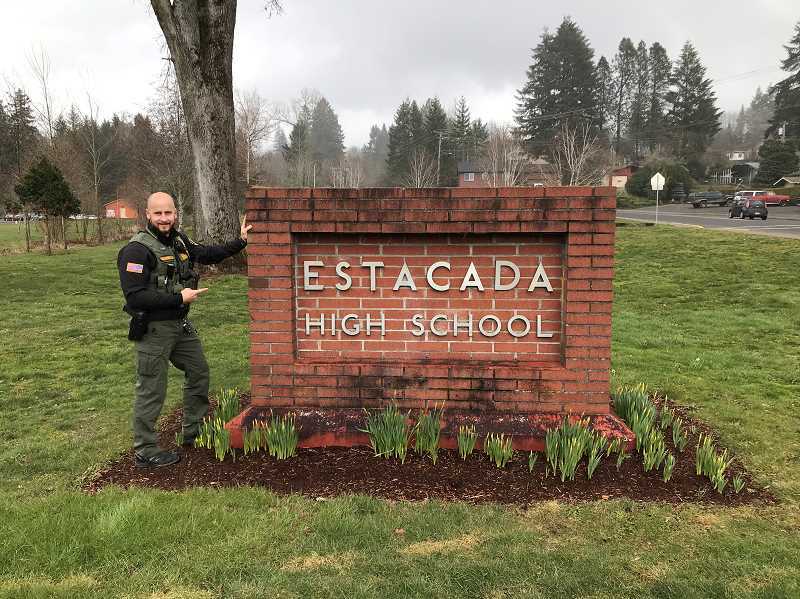 Earlier this school year, a full time resource officer was not available when the city of Estacada switched to the Clackamas County Sheriff's Office for law enforcement services. The role was previously filled with overtime hours from the Sheriff's Office. Russell sees the school resource officer position as an "opportunity to help kids, be a mentor, and help (them) learn from (their) mistakes." "If (students) make a mistake, I want to help dig deeper and find out what's happening between the scenes," said Russell, who also emphasized the value of connecting youths with relevant resources. "The county has so many resources available." He will have an office at Estacada High School and plans to build relationships with students at all Estacada schools. "I want to get to know people and build relationships. The more relationships I build, the more comfortable (students) will be talking to me," he said. "I want to help create a positive relationships for how they relate with law enforcement. At our core, we want to help them." Each day, Russell will ensure students make it to class, connect with them during lunchtime, potentially make home visits and work with school and district staff to see where he is needed. Estacada School District leadership appreciates the additional sense of security Russell will provide. "When students feel safe and comfortable, they're able to focus on their studies more," said Estacada School District Communications Director Maggie Kelly, who also added that the relationship between the resource officer and students is valuable. "It's great to be able to model positive relationships between law enforcements and students early on." Russell looks forward to being a positive force in the Estacada community. "I want (students) to see past the badge that I'm a person who wants to help them," he said, adding that he's looking forward to "being a mentor, encouraging kids, helping them take responsibility for their mistakes and learn from them."